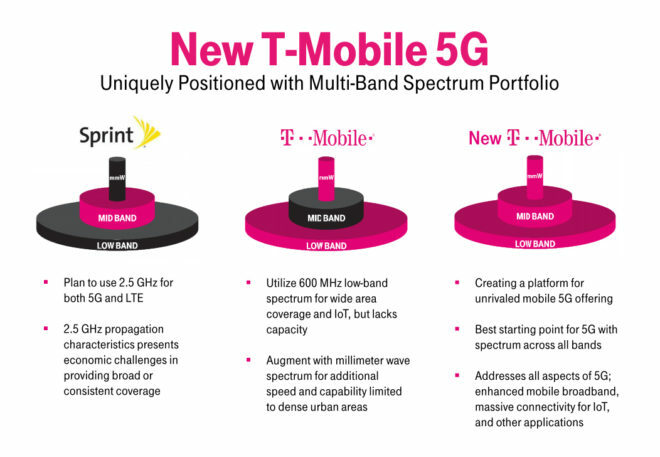 T-Mobile is working to persuade the FCC that its proposed merger with Sprint should be approved, and recently the carrier put together a presentation about what its 5G network would be like if T-Mo and Sprint do come together. T-Mobile’s presentation is pretty heavily redacted, but there are some interesting tidbits still available. For example, T-Mobile estimates that by 2024, the New T-Mobile’s 5G network would handle 21 exabytes of traffic every month. T-Mo also says that by 2024, its peak 5G throughput would be 4.2Gbps, compared to 2.8Gbps for T-Mobile and 0.7Gbps for Sprint if they remain separate. The New T-Mobile’s average 5G throughput in 2024 will be 451Mbps, T-Mo estimates, and its 5G coverage would include 293 million people with a throughput greater than 100Mbps. The presentation also suggests that with 5G, spectral efficiency will be higher for both 4×2 MIMO and 4×4 MIMO compared to LTE. Finally, T-Mobile claims that 5G handset adoption will be significant beginning in 2021, with the New T-Mobile driving 10 percent faster 5G handset adoption when compared to standalone T-Mobile and Sprint networks. T-Mo has said that it plans to begin selling 5G smartphones in 2019. In its meeting with the FCC, T-Mobile talked about how a combined T-Mo-Sprint would be able to combine its spectrum in the low, mid, and high bands to offer a “robust, nationwide 5G cnetwork to the benefit of consumers.” T-Mobile went on to say that the deal would allow for a boost in capacity thanks to an increase in the number of cell sites, the amount of spectrum for each site, and increased spectal efficiency. “The aggregation of these resources would enable New T-Mobile to deliver unprecedented capacity and performance,” the carrier claimed. The FCC is in the process of reviewing the proposed merger of T-Mobile and Sprint. The agency paused its informal shot clock on the review more than one month ago, saying that it needed more time to allow staff to thoroughly review new documents that’d been submitted by T-Mobile and Sprint, including a “substantially revised network engineering model.” T-Mobile and Sprint have previously said that they expect the merger to close in the first half of 2019. So curious to see how this will Pan out. TMobile hasn’t let me down yet so I have to believe they can do it. While I often speak against T-Mobile here and there, at least my posts sound somewhat coherent. Are you like 12 years old? I think it’s a case study of why you shouldn’t drink and type. It’s like you poured alphabet soup all over your table, then copied it down and posted it. I hope this goes through, ATT & Vzn are way, way too big, they need to feel more competition. No way this creates more competition but it will create a bigger competitor. Prices are sure to increase. Agreed. If the day comes that T-Mobile offers a faster service with better coverage than Verizon/AT&T, that will be the day that T-Mobile’s prices will be higher than the other two. Mark my words. This really isn’t true. The alternative is that T-Mobile (and obviously Sprint) will NOT be able to compete with them. They simply don’t have enough spectrum. Yes, T-Mobile has enough to service it’s current customer base and offer good service. But it won’t be cutting edge and will be similar to the early deployment of LTE, when it has taken years for T-Mobile to catch up. Thus in order to remain competitive they will spend a fortune buying as much spectrum as they can, continuing to gobble up smaller carriers and making deals to acquire spectrum that att/Verizon no longer want (like Band 12 spectrum they purchased from VZ). The cost to acquire those holdings is even higher, less efficient and fast, and will also raise prices. This merger is the only way to create a true third competitor in the 5G space. Unless you want T-Mobile to remain third place forever, always playing catch up. Keep in mind the only reason T-Mobile was able to get to the spectrum holdings they have now is by using the billions of dollars paid by ATT after that failed merger to buy up sums of spectrum like 700mhz from verizon. Without that merger breakup fee, T-Mobile would be nothing more than a regional player. And that’s no disrespect to the great job Legere has done. It’s just the reality. I get the frustration/hesitation on the merger but at the same time the losers either way are Tmobile customers. Either we get more spectrum and coverage with higher prices, or we get left behind in the 5g race and have a network that will continue to trail the other 2 for a little less money. I for one would like to be on the leading side of the next lte technology, it was just 2 years ago I was able to get lte inside buildings for the first time, while at&t and Verizon customers were having no problems for several years. Not higher prices. AT&T and Verizon are still viable competitors, and to get approved for the merger New T-mo will have to give up enough spectrum to form a new smaller player (smaller than sprint yet still viable). If this merger falls through, T-Mobile will have to make one or both of two poor choices: 1.) Spend vast sums of money buying up as much extra spectrum as they can, mostly spectrum other carriers don’t need or which isn’t very effiecent. This raises costs and could also lead to higher prices and/or 2.) Keep pricing relatively low, don’t raise capex dramatically and accept the reality of being the third place large regional carrier similar to the early days of LTE. T-Mobile simply doesn’t have anywhere near the spectrum, on their own, as the Big 2. 600mhz is great, but that’s really not even fully 5G capable. Not the dramatic 5G speeds that will truly expand the space. It’s more like really fast current WiFi speeds outside your home. It won’t be able to deliver the ultra fast speeds that customers will need, especially compared to what the big carriers will offer. It will take their plan to go after fixed 5G (to compete with your fixed home internet) pretty much off the table too. Plus, Sprint will eventually die without this merger and be sold piece meal anyway. They are hemorrhaging money and have few pathways out. Thus their 2.5ghz spectrum may be sold in some form to the Big 2 in the end, which is worse for everyone. It’s not about eliminating competition, it’s about making sure there are more than two realistic competitions in 5G. Without this merger, there won’t be. You’re discounting the Dish spectrum that must be deployed or returned. T-Mobile could certainly work with Dish to get that spectrum deployed in a hurry. It’s about eliminating a competitor as much as anything else, and getting a return on investment for the Germans. Don’t buy the hype. And the Dish spectrum matches up perfectly with T-Mobile’s current holdings unlike with Sprint. I believe that the first of Dish’s spectrum is set to be taken away in a year and they’re not even anywhere close to deploying it.